Even at the start of a new congressional cycle, time is of the essence for advocacy issues, as minds are being made up and positions taken very early, often before the public is aware. It is the politics of the process—the jostling, probing, and ossification of law-making—that seem to take such an inordinate amount of time. To be effective, a difficult proposition in the strident, partisan air of Capitol Hill, a trade association needs to be in front of key congressional offices as early and as often as possible. In fact, much leg work should be done in the prior Congress or Congresses to pave the way for receptivity, trust, and acceptance. Few legislative victories are born and realized in the same Congress. That is why the annual federal Legislative Fly-in is so important. Your physical presence makes surety issues real in the minds of elected representatives and staff. These issues suddenly are more than mere printed words on paper; they are associated with the flesh-and-blood faces of constituents who care enough to come to DC to say what matters to them. More touches in individual congressional offices promote constancy and consistency of message, which matters greatly. Congressional offices know by your visit that you are likely someone who votes and does so on specific issues, the kind of person who can only be ignored at their political peril. Anyone remember the experience of incumbent Eric Cantor? Ignoring constituents is not a viable political strategy. 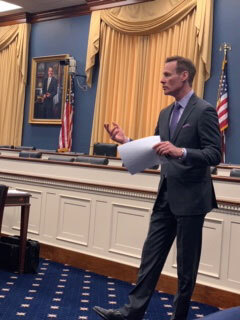 Director of Government Relations Larry LeClair certainly has been plowing considerable ground with critical congressional offices already, preparing your path for productive dialogue with congressional offices on June 5 and 6, the dates of this year’s Legislative Fly-in. Register for the Legislative Fly-in. This will be a special Fly-in, as for the first time, it will be a joint fly-in with The Surety & Fidelity Association of America, magnifying our voices on the importance of surety bonding. NASBP and SFAA staff have made numerous visits on Capitol Hill with leadership and staff of the House Small Business Committee, the House Transportation and Infrastructure Committee, the House Ways and Means Committee, the Senate Armed Services Committee, the Senate Small Business and Entrepreneurship Committee, the Senate Environment and Public Works Committee, among others. 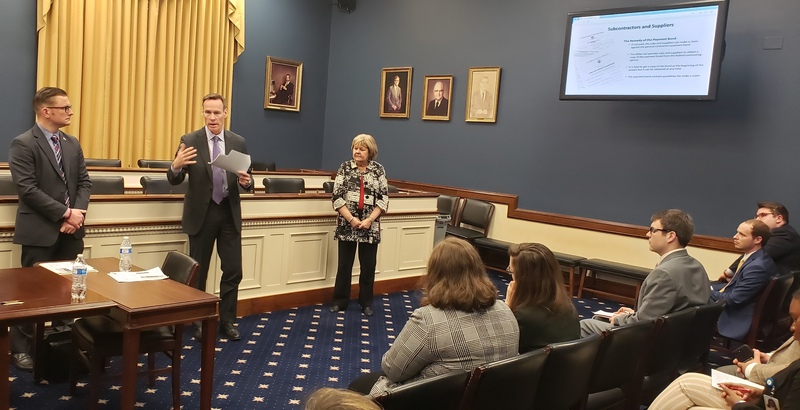 Together, NASBP and SFAA have hosted two joint political action committee fundraisers: one for House Small Business Committee Chairwoman Nydia Velazquez and one for Senator Rob Portman. Chairwoman Velazquez already has introduced a NASBP-requested bill, H.R. 224, which would exempt the Miller Act from being subject to periodic indexing for inflation, which is the reason that the Miller Act threshold increased from $100,000 to $150,000 and may increase again in 2020. LeClair is in the process of securing bipartisan support for H.R. 224 in the House. LeClair (pictured presenting in both photos) has assumed an informal leadership role with the Construction Industry Procurement Coalition, a coalition of major surety, design and construction associations, working for common-sense construction procurement reforms, including bonding on federal public-private partnerships, and was instrumental in putting together a construction educational event for congressional staffers that occurred in March. LeClair and SFAA President Lee Covington also have visited with individual offices on clarifying that the Water Infrastructure Finance and Innovation Act and the Transportation Infrastructure Finance and Innovation Act contemplate surety bonds as needed protections for federal loans and grants for infrastructure projects. But success ultimately will not come without your personal involvement--to move these initiatives further, NASBP needs your presence in DC in June. If you cannot make it, consider sending someone else in your office. Talk to your fellow colleagues about going together. Producers and underwriters should consider teaming up to be a powerful one-two punch of information on surety practices. Remember, when you come to DC to discuss surety to elected representatives and staff, YOU are the subject matter expert. There is no need to be nervous, and NASBP staff will be with you to provide guidance and support. If you would like to learn more about participating in the NASBP & SFAA Legislative Fly-in, please feel free to ask questions at the Annual Meeting in Austin, Texas or contact me at mmccallum@nasbp.org or Larry LeClair at lleclair@nasbp.org.